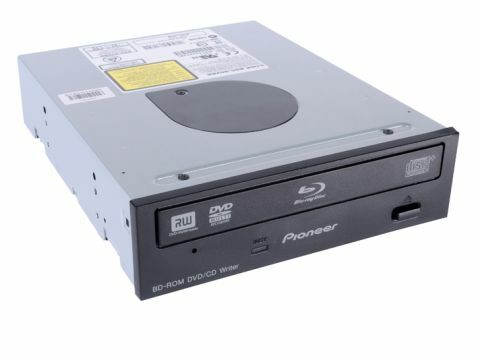 The Blu-ray vs HD DVD battle is a twisting turning leviathan that has just got a lot more slippery with the release of this drive - a non writable Blu-ray drive that's a lot more tempting an option thanks to its low price. You can burn DVDs from it as well, although increasingly this is becoming more and more niche an option as USB drives take over. You can't plug your shiny new Blu-ray drive into just any controller on your motherboard - inadvertently attaching it to the RAID controller on our test rig had it spluttering into Vista, only to throw its arms in the air and make said controller sulk. In fact it's still sulking. Thankfully I don't need it for day-to-day use; otherwise I might be truly upset. Once installed and plumbed into the right SATA controller, you're pretty much good to go - apart from the fact that purely as a piece of hardware, this is about as interesting as a primed wall and a bucket of emulsion. Thankfully, Pioneer has seen fit to bundle the BD edition of CyberLink's PowerDVD in the box, which affords 'beyond high definition' visuals straight out of the box. Amazingly, it works. Yup even on a thoroughly un-DRM'd machine, I was able to enjoy the grainy not-quite in focus imperfections of the latest bulldog bond, gawp at Nine Inch Nails live in concert. And I'll have to admit, that it was a far more impressive experience than I was expecting - not quite enough to get off the fence and back this over HD DVD, but enough to be tempted. And at just over a hundred quid we' re finally getting into the realms of this being an option actually worth considering.